The weather's been a bit changeable, but we've had some absolutely glorious days. To celebrate National Picnic Week Higgidy asked me to share my favourite picnic spot with them and you can find it along with other secret picnic spots around the country, tips and recipes in the Little Higgidy Picnic Guide. It's free so pop over there and download it. I've put together my 10 top tips and top 10 favourite recipes to inspire your next picnic. Freeze bottles of water a few hours before the picnic and pop them your basket beside the food. They'll keep the food cool and you'll have nice cold drinks to enjoy. 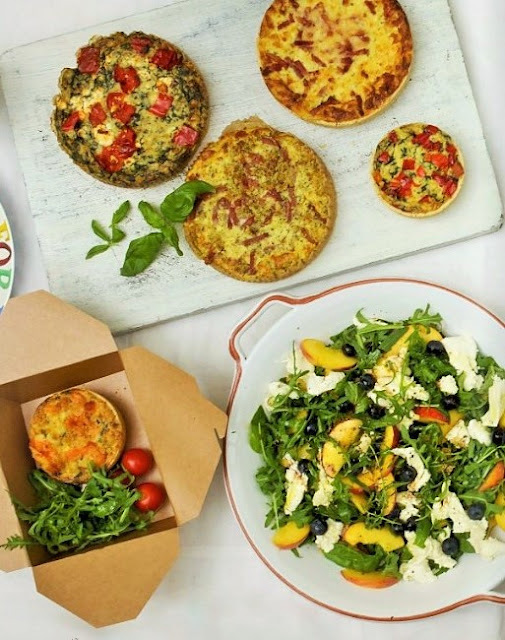 Make one or two stand out dishes, such as a really special salad, a pie or a quiche. The rest of the picnic should be simple finger food such as vegetable crudités, hummus, breadsticks, cheese and fruit. Brownies, muffins and cookies are great for a picnic dessert. Take a tablecloth instead of a rug to set the food out and sit on. It takes up less room, it's lighter and it's easier to wash.
Make sure you have plenty of cutlery and napkins. Remember a bottle opener, this is the most commonly forgotten picnic item. Remember to take bin bags for your rubbish. Take something to do after the picnic, a ball. a frisbee, cards or books. Remember to take layers and waterproofs. The weather is so changeable here in the UK. Take some tasty chutney to serve with these rather fabulous scotch eggs. Why not try my Hot Mango Chutney or my Chunky Plum and Apricot Chutney. If you don't have time to make chutney take your favourite shop-bought chutney. 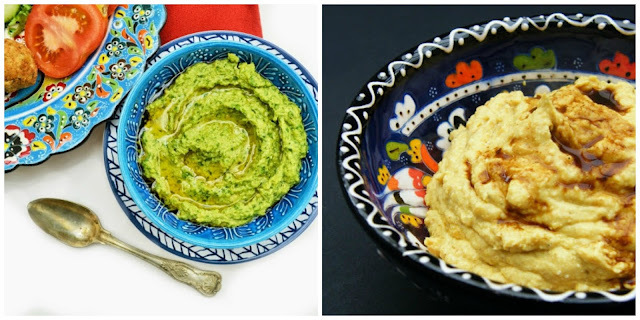 Serve with vegetable crudités, breadsticks or oatcakes. with you, but make sure you have a cold pack or frozen water bottles to keep them cool. I love stuffed picnic loafs. They are such showstoppers at a picnic, but simple to make. Add all your favourite fillings, put the lid back on, wrap, add a weight and chill in the fridge overnight, then cut at the picnic (make sure you take a bread knife with you). The puffs are a modern and easy alternative to sausage rolls and the wrap, well that's one of my favourites. The surprise ingredient is marmalade! 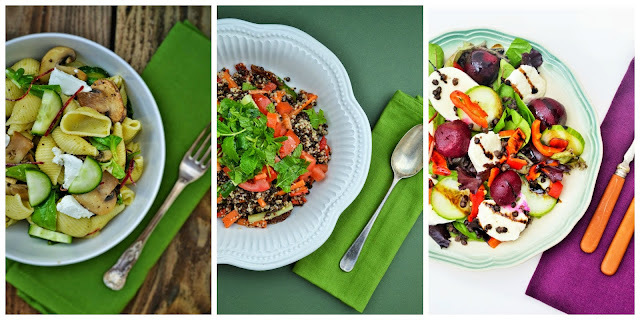 Three of my favourie salads. The first includes the crunch of cucumber, which works really well in this pasta salad, of course you can leave out the goats cheese for a vegan salad. The bulgur salad is a classic and travels well. The last salad is wonderful, but I'd take the beetroot in a separate container and add it when you put out the salad, or you will end up with a very pink salad. These salads will also require a cool pack or frozen water bottles. Chocolate always goes down well at a picnic and these brownies are particularly good. Wrap the brownies individually in greaseproof paper and pop them in a tupperware box for less mess. The blueberry loaf cake is one of my real standby cakes. Bake it with blueberries or raspberries. It's moist and has a wonderful vanilla flavour, but the best thing is it slices really well. I hope I've inspired you to head out with a picnic soon. We all spend too much time caught up in our busy lifestyles, but it's so important to have some fun and make some memories. We'll never look back and feel joy at how much time we spent working or cleaning and I'm one of the biggest culprits. so I'm going to make the effort too this Summer. Disclosure: Higgidy paid me to write my article for their ebook. I was not expected to write a positive review and any opnions expressed are my own. It really works well and you don't need to freeze them completely for kids lunch boxes, just for a couple of hours. Some great idea Jac I love the idea of freezing water or juices in bottles as they act as ice packs too to keep food chilled. We love picnics - I have even had picnics on the verandah which Sylvia loves! I love dips and crudites and also find grapes a great snacky fruit to take along. The tip about freezing a water bottle is great - reminds me of summer lunches at school. I'd love to make a stuffed picnic loaf for a picnic but it is far too cold for picnics here. Ah yes, you are always going into Winter as we are hitting Summer. Although it's pretty cool here today. I have a cardi and a jacket. Porch picnics sound fun. Some great tips here! I fear that we're not going to get a summer this year in Shetland. The weather has been absolutely terrible so far. Fingers crossed it improves! It's pretty cool here today too. We have had some great days, but it's definitely cooling down. Great tips. I want to have a picnic today and the frozen bottles of water idea is so clever. Oh excellent Anca. Have fun at your picnic and hope the sun shines. We're enjoying having our picnics at the beach since we moved... the only issue is getting sand in our sandwiches!!!! Great post Jac, lots of lovely ideas and a reminder that I need to try making a stuffed picnic loaf as they look so brilliant. Ah yes the sand, that's always fun. Definitely try the picnic loaves, they are such fun and super tasty. I know, crossing my fingers too. Yes if you can stick to it, it's the best way to go. People love snacky things and finger food. You have some brilliant tips, esp. about packing layers and a tablecloth to sit on, great idea. Your food looks so perfect for the summer and for picnics, colourful, tasty and so delicious. I will be trying your salads out first! The tablecloth tip is a really useful one. Thanks Laura, I hope you enjoy them. I love all the recipes in here and the post is bright and beautiful! 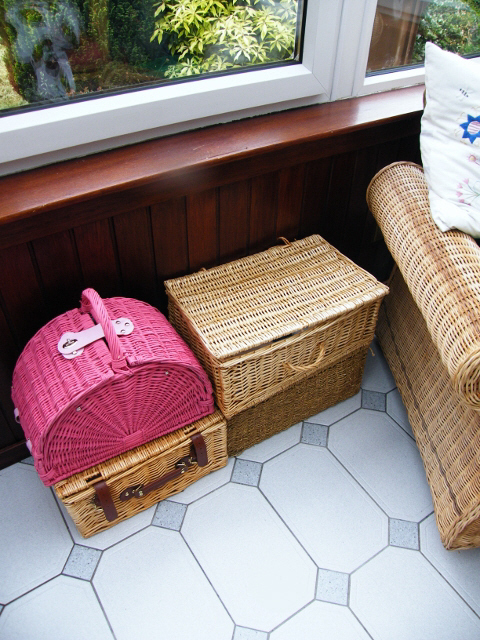 I agree that it makes so much more sense to keep the picnic basket hassle free with bits and bobs around one big main! I am so coming on a picnic with you! All the recipes sound fantastic and the top tips are well worth remembering. I've been known to leave something vital behind on the kitchen table so now always double check. Let's hope you get some sunshine for that soon. They all look great!! I love the look of that Stuffed Picnic Loaf - those layers! !